1. How old are you and what is your favorite food? I’m 152 years old and my favorite food is definitely gingerbread cookies. 2. What is the best thing about Santa Claus’ Main Post Office? The best thing is picking up letters for Santa and looking after them! I still get emotional when I read the beautiful, moving letters we receive! 3. What brings the Christmas spirit? Children’s twinkling eyes and palpable excitement. 4. What is your special talent? I am an extra super speedy reader. It’s a necessary skill indeed, because Santa Claus has received approximately 17 million letters from almost 200 countries since 1985! 5. What is the best part of Christmas? The atmosphere created by soft, warm candlelight and the scent of cinnamon. 6. Describe a normal day at Santa Claus’ Main Post Office? At Christmastime, I light the candles for the lanterns at Santa Claus’ Main Post Office. Depending on how cold it gets, I also light the fire in the wonderful fireplace. In addition to that, I collect and sort the mail sent to Santa and the nearby residents. If I find some lovely drawings or other nice things in letters sent to Santa, I put them in frames or display cases in the fireplace room. I attend to visitors at the reception desk and instruct first-timers on “how to write addresses and where to put the postage stamp”. I patter around in my elf shoes to get the mail out at the right time, either on the same day or in time for Christmas. 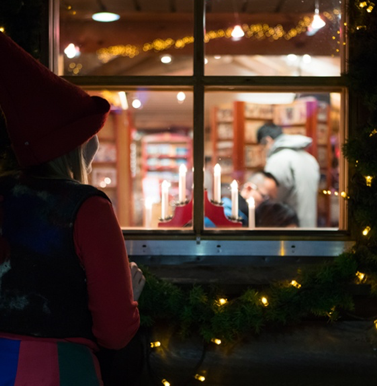 With the bell on my elf hat jingling, I also keep the shop at Santa Claus’ Main Post Office in order and maintain the Christmas spirit. 7. What do Christmas elves wear in the summer? Christmas elves can wear what they like in the summer, but we mostly prefer red. A summer outfit is born when you remove a few layers from under your elf clothes (elves dress warmly in the winter) and change into a thinner summer shirt. Otherwise, elves’ clothes are about the same in the winter and summer. An elf is always an elf. Felt hats and slippers in the summer and winter. 1. How old are you and what is your favorite food? I’m just about 40 and a half years old. My favorite Christmas food is absolutely Mrs. Claus’ famous Christmas porridge with cinnamon sugar. I usually try to find the almond in the porridge for myself, but I don’t always succeed, since Mrs. Claus keeps a very close watch on the porridge pot. 2. What is the best thing about Santa Claus’ Main Post Office? 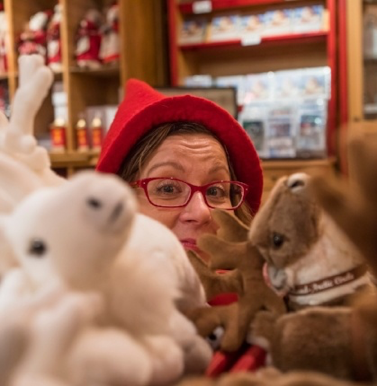 The best thing is that at Santa Claus’ Main Post Office, it’s Christmas all year round, since we’re open 365 days a year – in other words, on every day of the year! Christmas brings people together and is a time when almost everyone is in a good mood. 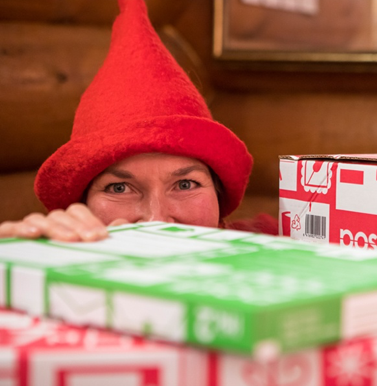 It is an honor to be the official post office of Santa Claus and to look after Santa’s correspondence. 3. What brings the Christmas spirit? It’s definitely the white snowbanks here at Santa Claus’ Village and the first echoes of Christmas songs through the fells when Santa Claus goes out skiing over the snow. 4. What is your special talent? I am extremely sharp-sighted and am, among other things, a three-time winner of the elves’ national precision vision championships. This is helpful when we elves keep track of children’s nice and naughty behavior. 5. What is the best part of Christmas? Christmas food and children’s smiles. 6. Describe a normal day at Santa Claus’ Main Post Office? The days are full of laughter and happy chatter. From summer to winter, our main topic of conversation is Christmas – what could be better? 7. What do Christmas elves wear in the summer? We often spend our summer holidays in the Finnish Lakeland, but sometimes the whole crew hops on reindeerback and rides to the warm south. 1. How old are you and what is your favorite food? 140 Christmas Eves is my current tally. My favorite Christmas food is a cup of hot mulled wine with almonds and raisins. 2. What is the best thing about Santa Claus’ Main Post Office? The best thing is being able to see the children’s joy when they bring their letters to Santa Claus. Santa Claus’ Main Post Office also has a wonderfully international atmosphere, as visitors come here from all around the world. Most of our visitors come from Germany, France, Spain, Great Britain, Italy, Russia, Asia and America. That’s why we mail elves speak around 10 different languages. 3. What brings the Christmas spirit? I think Christmas food, Christmas songs and the glow of candles are excellent ways to create a Christmas atmosphere, but for me personally, Christmas magic comes from the peacefulness of the Arctic Circle, the sound of snow crunching under felt boots, the starry nights and the northern lights that blaze in the sky from time to time. 4. What is your special talent? 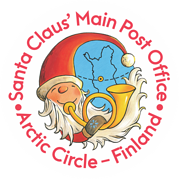 I am super fast at stamping the Arctic Circle postmark on letters sent from Santa Claus’ Main Post Office. The Arctic Circle postmark is a unique postmark you can’t get anywhere else. The first Arctic Circle’s special postmark was a reindeer’s head, and it was created in honor of Eleanor Roosevelt’s visit in 1950. Since then, several different postmarks have been used at the Arctic Circle. The postmark that decorates our letters today, featuring Santa Claus and his reindeer, has been in use since 2012. 5. What is the best part of Christmas? Making people happy. You don’t always need an expensive gift to make someone happy – what’s important is showing others you care and spending leisurely time together. 6. Describe a normal day at Santa Claus’ Main Post Office? The day starts with the mail elves’ team meeting, where we discuss current matters going on at Santa Claus’ Main Post Office. That’s really the only predictable part of the day, as the rest of the day can be full of surprises. Sometimes Christmas songs ring out at the Main Post Office, while other times we find ourselves sitting with visitors and discussing Santa Claus’ real age. 7. What do you do when Christmas stress takes over? Here’s a tip I’ve found works well: 10 deep breaths, 3 jumping jacks, 1 backward somersault and a row of chocolate. Once you’ve done this, your mind is calm and you’re ready to take on anything!